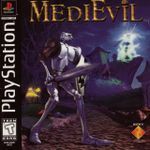 Medievil is a game which follows the crusade of Sir Daniel Fortesque, hero of Gallowmere, as he valiantly hunts down all who would harm his home land. Actually, that's not quite right...really, Sir Dan is just a loser who's death at the Battle of Gallowmere was so embarassing (shot in the eye by the first arrow) that the king simply declared him a "hero" and had him quickly buried. However, the evil sorcerer, who previously lost that battle, has returned. It's up to Sir Dan to valiantly fight, eyeless and jawless, to earn his reputation. The game mixes medieval fantasy with just a slight bit of horror. Very little is actually that scary; in fact, much of the game is quite farcical. This does not take away from the actual gameplay experience though. Players will travel through various levels, tracking Zarok (the sorcerer) through Gallowmere. Along the way, they will meet its quirky inhabitants, many of which will offer a helping hand. The player can simply run through the levels without looking back, or they can explore each level fully, slaying enemies to fill the "chalice of souls". Filling the chalice will cause it to appear in the level to be collected, which will then grant the player access to the hall of heroes. This is required to gain most new weapons as well as other goodies. Amongst the weapons players stand to gain are better swords, long bows, an axe, a dragon potion, and even chicken drumsticks. Medievil was a breath of fresh air to the Action Adventure genre. It's comical setup mixed with intuitive, serious gameplay and a great soundtrack makes it a wonder for all time.